Is this cup of Tim Hortons hot chocolate 3/4 full or 1/4 empty? Whatever you think of the brand – and regardless of ownership – Tim Hortons is a Canadian institution. No, the donuts aren’t great, and yes, you really should look at the nutritional information before ordering the chili, but the beautiful familiarity of Timmy’s – even the missing apostrophe in the official name – powers road trips, snack breaks and coffees with friends across the country. The hot chocolate at Tim Hortons is good. It’s basic, it’s sweet, it’s hot, and it fills a need when you don’t feel like a cup of coffee. How many kids have wrapped their mittens around a warm cup of the stuff after hockey practice or swimming lessons? It’s probably the next most mainstream, publically tasted hot chocolate in the country after Carnation, so trying a take-home tin seemed an obvious populist antidote to the more chichi organic, fair trade options presented so far this month. The Pitch: No pitch other than the Tim Hortons name and “Fresh Friendly Familiar … Always.” Says it all. The Look: Foiled cardboard tube with metal ends. Has the typical Tim Hortons branding, with that familiar logo and cup design. If you’ve lived in or travelled through Canada for any length of time, you can practically taste the coffee or hot chocolate just by looking at the cup. The Cost Per Cup: Each serving requires 35 grams of mix, and a tin contains 500 grams, meaning there’s a bit more than 14 servings per tin. A 500 g tin costs $4.69, so that works out to about $0.34 per serving. Note, however, that each serving is made with a lame 175 mL (6 oz) of liquid. By comparison, the smallest hot beverage cup at Tim Hortons is the 8 oz “extra small.” That makes the 6 oz serving pretty dodgy, especially since the nutritional information is given per 6 oz serving. Double the serving, and you’d get about enough (powder and liquid) to make a “medium” hot chocolate. But you’d only get 7 of those per tin, and the cost would be closer to $0.68 for each one of those. The Ingredients: In the very long list is “hydrogenated vegetable oil,” part of a “creaming agent.” Yuck. The Taste: The directions say you can make it either with hot water or hot milk, so I tried it both ways. Made with water, the drink is clearly missing something. It’s not undrinkable, there’s quite a lot of chocolate flavour, and the ratio of water to mix is right. Sadly, other unpleasant, chemical flavours jump out in front of the chocolate. As it cools, the flavour and texture go from bad to worse; lukewarm, it turns a gross combination of thick and slick. Made with 2% lactose-free milk, there’s a huge overall improvement. Everything tastes more full, rounded and flavourful. The milk smoothes out the rough artificial edges, though it also gets sludgy as it cools. It’s not a fancy hot chocolate, but it’s still satisfying and rich. Cost: $4.69 for a 500 gram tin at the Sunnyside Safeway Tim Hortons in Calgary. Value for cash money: Very good. Availability: Everywhere you’ll find a Tim Hortons in Canada. Nutrition (MILK NOT INCLUDED): Per 2 tablespoons (35 grams): 140 calories, 1.5 grams of fat, 160 mg of sodium, 0 grams of fibre, 1 gram of protein. The verdict: Unless you plan to stick with the smallest mug in your cupboard, the suggested serving size is somewhat silly. But double the size, and the chocolate mix alone has 280 calories before milk. On the plus side, you can really taste the hot chocolate. The mix ratio is closer to accurate than with some other hot chocolates, and I like that honesty. 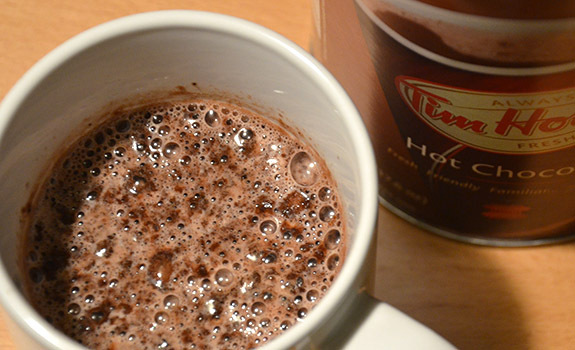 For fans of Carnation hot chocolate, the Tim Hortons mix is worth a look. I am interested in your ingredient’s in your Hot Chocolate. I have to be careful, what I consume. Due to allergies. Tried today after a long time and hate that thing. Is Tim’s hot chocolate gluten free?